I have a particular interest in crab apples that are edible out of hand, with good dessert quality and these two really fit that description. They are not only very good to excellent in eating quality, but they are also the second apples to ripen here, this year in the first two weeks of July. “First early” apples are usually low in sugar, grainy or mealy and just not that great for eating. Time will tell more, but I can already tell from just a few samples that these apples are a great find. I’ll probably be breeding with these in the future as I think excellent dessert crabs are something that needs work and has great potential. These are super easy to eat, since you can eat the entire fruit with the core, seeds and all. The seeds only add to the flavor, like an almond flavor filled center. A walk around looking at various parts of my apple breeding project. It doesn’t look like much, but I think it’s getting the job done. I spotted my first blossom while filming this. Way cool, that means I’ll probably have some bloom next year, hopefully followed by fruit! Well, giving away onion bulbs was fun last year (or whenever that was) and I’m happy to think of all those onions dividing away out there to be shared out to friends and neighbors, so I decided to give away some seeds this month. Not the best timing, but I know you guys aren’t fleeting gardeners for the most part. I save seed pretty regularly. I don’t save everything every year. Not at all. But every year I’m saving some seed or another. I can only plant so much, so I end up giving most of them away at the Farmer’s Market and at the local Scion Exchange. I had to give up the Farmer’s Market for now, and all bets are off on whether I make it to the Scion Exchange. I thought, what better people to give seeds to than blog subscribers! I feel kind of bad that I haven’t done it earlier! I have been gardening and intentionally testing varieties for long enough to have amassed some favorites that are standard fare. I don’t spend much time poring over seed catalogs anymore, just to be tempted into trying new varieties that are unlikely to be any better than what I already grow. Once in a while I’ll pick a vegetable type and gather multiple varieties of it to do some loose trials, but I haven’t done that too much for a while and it usually results in little more than a light wallet and a confirmation that what I grow already is pretty good. No doubt there are better varieties out there, but finding them takes some effort and money. So, most of these are varieties that have stood the test of time. Your mileage may vary due to climate, taste or what have you, but they work well for me. 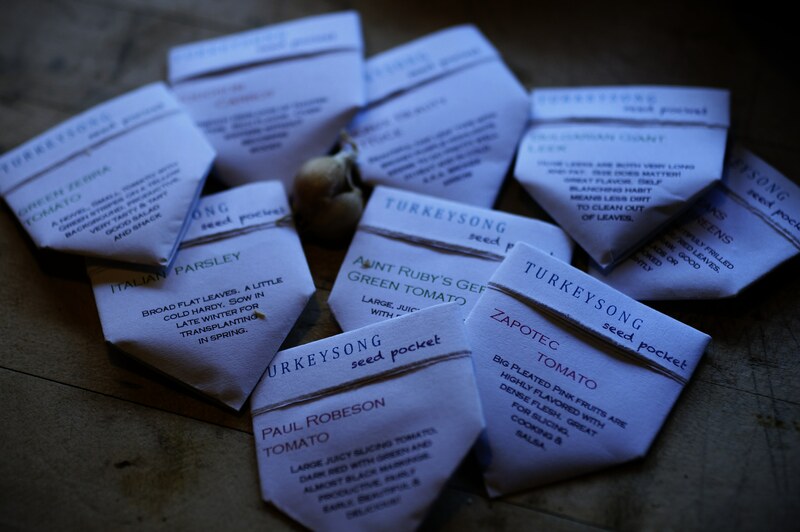 Each packet will have 10 seed varieties and one I’itoi onion bulb. There are 14 packets altogether, so when those are gone, they’re gone. And again, this offer is for subscribers.